Dungeons & Dragons has opened the gates to its ivory tower. Earlier this year, the behemoth role-playing game franchise announced the launch of its Dungeon Masters Guild, a platform for players to publish lore, maps, character designs and adventures based on Dungeons & Dragons intellectual property. In the process, content creators can earn a few bucks off their D&D-inspired materials. 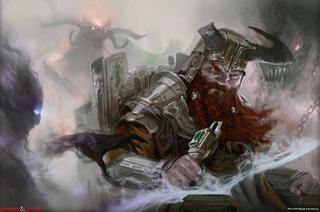 Calling it a “massive communal design network, one that is officially recognized and sanctioned by [publisher] Wizards of the Coast,” D&D has found a way to harness the creativity of their fanbase to improve the game without exploiting those fans. It’s pretty code-breaking to allow players this level of involvement in an official RPG’s licensed material. Although royalty rates are only 50%, some of the more popular DMs Guild writers I spoke with have made several hundred dollars a month off their D&D adventures—below the industry standard, but not unsatisfactory for a hobby they’d do anyway. Mike Mearls, the game’s lead designer, and Chris Lindsay, architect of the DMs Guild, spoke with me earlier this week about their plans for increasing player involvement in the D&D franchise while protecting their intellectual property. Cecilia: I’ve spoken with a few Dungeon Masters who put their content on the DMs Guild. They were all extremely impressed by it! Where did the idea come from? Chris: Dungeons & Dragons is about creativity, whether you’re a player making your character or a Dungeon Master designing campaigns. There are a lot of kids out there who aren’t professionals, who may not be interested in being a professional, but who create really cool, neat things for their Dungeons & Dragons games. I wanted to provide a place for them to form a community. Cecilia: Do you feel like, at this point, you’ve adequately cultivated that community? Do you feel like the community has become stronger or just moved onto this new platform? Mike: [The DMs Guild] has given focus to what otherwise were scattered conversations. It’s is a natural next step from homebrew stuff, and it’s also kind of drawing into focus what players talk about on blogs or Reddit. It’s not a social network itself. I don’t want to compare it to Steam, which is basically the go-to place to buy PC games, but now everyone knows where to go to find this [homebrew] stuff. From our end, we’ve just scratched the surface of what we’d want to do with the DMs guild. Chris has mentioned having face-to-face seminars. We’re looking into doing more online stuff, talking how to design things on YouTube, and making more of a dialogue between ourselves and creators out there. Cecilia: You’re spinning the DMs Guild as something that could help bring D&D content creators onto the D&D team. Has that happened yet? Have you been in communication with any Dungeon Masters? Mike: Not yet, in terms of like, talking to someone who’s started work on the Guild and now they’re working on projects for us. We’re starting to take steps in that direction. A lot of that is just because of the way we schedule things out. There hasn’t been a project we’ve needed writers for since we launched the Guild, usually because we’re scheduling people ahead of time or we have specific people in mind for something. Now, we have a couple of writers we’re looking into bring on who have done D&D Adventurer’s League stuff through the Guild. Not exactly people we didn’t know, but this is the first step in that direction. Chris: I will say that the administrators of the D&D Adventurer’s League, our organized play program, are taking a close look at DMs Guild adventure authors whose adventures are doing well. They’ve started doing so with an eye toward currying them to create content specifically for the D&D Adventurer’s League. Mike: The next step from there is working on the official D&D books we publish. Cecilia: With regard to that, sources have speculated that content created for the DMs Guild is a way to tide people over between these bigger official releases. It seems like Wizards of the Coast has been putting out more comprehensive, longer, higher-production-quality campaigns instead of smaller stuff. Is that the case? Mike: Exactly. We drive books on big projects because that’s where we’re at our best. We have resources to work with multiple people, do a complete level 1-10 campaign. There’s always a tension between adding stuff to the game and adding too much stuff to the game. There are people who want even more. Some people want new stuff for their campaigns; some people want shorter adventures to run in one night; some people say the official character classes aren’t enough or like crunching new mechanics. If we try to sell books to that person, DMs in the middle of the curve feel like it’s overwhelming. The DMs Guild is a nice middle ground where no DM would expect all of it to be in play. DMs can pick and choose what content they want to use. Cecilia: Have you guys seen anything on the DMs Guild that you’ve consciously appropriated into the D&D Forgotten Realms canon? Mike: Not yet. If we see something popular in the Guild, it kind of benefits us as game designers to say, “Hey we want to include this in an upcoming book.” We’d pay that person for the design. That’s an obvious step to take. With the Forgotten Realms canon, that’s a little tricker. We plan our stories three or four years in advance. We have this attitude that the Realms canon really isn’t really something we’re trying to sell to people. It’s more of a tool we use to keep track of our own stories. The Realms are only as real as the DM wants it to be. It’s more a general outline of events that happen. Cecilia: That’s so fascinating. In your eyes, was there a problem in the past with people using copyrighted material for their own DMing purposes? Was this part of why the DMs Guild was created? Mike: Yeah, that’s a good way to look at it. Like Chris said, people have the tendency when they’re running a D&D game to create material for it. If you’re running a Realms game, you’ll create Realms material. People who want to post the new class they made up, distribute the town they made or show their map of a level they made... there’s this natural tension. Obviously, we have to protect our intellectual property. We don’t enjoy doing it, but it’s what you have to do. [The DMs Guild] is about giving people an outlet to be creative and we don’t have to worry about intellectual property law. We’re always trying to work with the community. We can say, “Hey, you published a PDF of Forgotten Realms lore that Wizards owns, but if you bring it over here to the DMs Guild, it’s totally cool, and you can even charge people for it.” It’s really kind of the best of both worlds. Chris: From that perspective, it’s really like we’ve opened up the Chocolate Factory and we’ve let players come in to play with the Oompa Loompas. Chris: It’s cool, as long as they play by the rules. Mike: When it went wrong was when people were kidnapping Oompa Loompas. Kidnapping is a crime, so please don’t do that. But if you want to come and hang out with them, sure! Cecilia: I like what you guys are doing with the DMs Guild. I’ll put some of my own stuff on it, too. Mike: Role-playing game publishing has been, for a while, an old boys’ network. You had to know which convention to go to, who to talk to to get attention. What I really like about the DMs Guild is that we just get to see what people are doing. We don’t have to count on, like, this person knows that person, and that’s how we hear about them in terms of hiring them to write. Its cool when you meet people at conventions, but this makes it easier for us to find new writers. Chris: And for those interested in becoming professionals at some point, the DMs Guild is a fantastic way to employ their craft and get real feedback from fans on the material. It’s really a nice workshop. Cecilia: Yeah, when you guys had opened 5e to user commentary, I had never seen that before. Mike: People think of games as a service. For us, this tied into that concept. We are creating a platform with our ruleset that lets people play adventures, whether we create them, they create them, or someone on the DMs Guild does. It’s more like, these rules are about what people using them want to do. So unless we understand what people are doing with them, we can’t create an effective ruleset.